Three years ago, public pressure pushed through a ban of these cruel bombs. But now the US is lobbying nations to quietly sign a new law that allows their use — signing the death warrant for thousands of other children. Most countries are still on the fence on how to vote. Only if we raise the alarm across the world can we shame our governments to block this deadly decision. Thousands of people — many of them children — have been maimed or killed by these bombs. When they are fired, they spray small “bomblets” over a wide area, many of which fail to explode. Years later, people disturb them in their fields or school playgrounds not knowing what they are, and they explode. Cluster bombs and land mines were banned because citizens raised the alarm across the world — with victims and survivors leading the way. For their sakes and to ensure no more lives are lost, let’s not allow these cruel weapons back and join together now to demand a more peaceful world. Please pass this on. And do take the time to sign it. US to stockpile cluster bombs in Australia? Despite Australia having signed the convention against cluster munition, a US base may transport and stockpile munition. This month, a civil lawsuit in Israel in the case of our daughter Rachel Corrie will converge with the seven-year anniversary of her killing in Gaza. A human rights observer and activist, Rachel, 23, was crushed to death by an Israel Defense Force (IDF) Caterpillar D9R bulldozer as she tried nonviolently to offer protection for a Palestinian family whose home was threatened with demolition. This lawsuit is one piece of our family’s seven-year effort to pursue accountability for Rachel while, also, challenging the Occupation that claimed her life. Seven years later, Rachel’s memory is still vibrant. I’m writing to you from Israel where we are plaintiffs in a civil case against the state of Israel for its responsibility in her death. In addition to seeking accountability through the Israeli court system, we’re asking all of our friends to support Rachel’s vision of freedom for Palestinians living in the Gaza Strip by participating in a national call-in day to the White House. Urge Special Envoy for Middle East Peace George Mitchell to visit Gaza and demand that the United States break the blockade of Gaza by providing immediate humanitarian aid and building materials. Tell us about your call. Tracking your calls makes a difference. You can also make the call tomorrow. Please forward this to help spread the word. P.S. 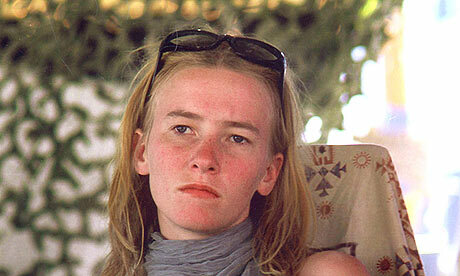 Click here to view the trial updates page on the Rachel Corrie Foundation website. A few Documents from above link. Today, March 15 2010, the Haifa District Court saw the third day of testimony in the civil lawsuit filed by Rachel Corrie’s family against the State of Israel for her unlawful killing in Rafah, Gaza. Rachel was crushed to death on March 16, 2003 by a Caterpillar D9R bulldozer. She had been nonviolently demonstrating against Palestinian home demolitions with fellow members of the International Solidarity Movement (ISM), a Palestinian-led movement committed to resisting the Israeli occupation of Palestinian land using nonviolent, direct action methods and principles. Today’s only testimony came from British citizen Alice Coy, a nurse, who was an eyewitness to the killing. The state spent most of the day trying to establish that contrary to all eyewitness accounts and human rights reports, the Israeli Military had no intention of demolishing homes in the area on the day Rachel was killed. She first visited Israel in order visit Israeli family members. When the Israeli Military interviewed her on April 1st about Rachel’s killing, the soldier who documented her testimony refused to record her statement that she believed the bulldozers were going to destroy civilian homes. She believed the Israeli Military was planning to demolish homes on the day Rachel was killed because the Israeli Military had been demolishing homes on the Philadelphi Corridor in the days and weeks prior, and because they had already begun to demolish a house earlier that day by damaging its porch. She had spoken with many Palestinian families in the area where Rachel was killed whose homes had been demolished by the Israeli Military. She believed the bulldozer driver who killed Rachel could see her. She described her view of her work with ISM as promoting peace for the whole region. According to an October, 2004 Human Rights Watch report, Razing Rafah: Mass Home Demolitions in the Gaza Strip, between 2000 and 2004, the Israeli Military demolished over 2,500 Palestinian houses in Gaza, nearly two thirds of which were located in Rafah, resulting in more than 16,000 people – over 10% of Rafah’s population – losing their homes. The Israeli human rights organization B’Tselem, in its 2004 report Through No Fault of their Own, found that contrary to Israel’s claim that prior warning is given before a home is demolished, occupants were given prior notification in a mere 3% of the cases. Quote from testimony-Dr. Hiss disclosed that he had kept samples from Rachel’s body for histological testing without informing her family. Dr. Hiss admitted that he did not inform the family about their right to bury the samples and that the samples were likely to have been buried with other body samples from the Institute, but he was uncertain. This was the first time that the family of Rachel Corrie received confirmation that the Israeli Forensic Institute had indeed kept samples of her body, despite prior attempts to receive this information. Dr. Hiss has been the subject of a prior lawsuit in Israel brought by families for whom he did not return body parts and samples. Tags: Alice Coy, body parts, British citizen, Call the White House, Caterpillar, Cindy Corrie, D9R bulldozer, death, demonstrating, Dr. Hiss, Eye Witness Testifies, Gaza, Gaza Strip, George Mitchell, Haifa District Court, IDF, International Day of Conscience, International Solidarity Movement, ISM, Israel Defense Force, Israeli Forensic Institute, Israeli Military Investigator, kept samples of her body, killed, nonviolently, Palestinian home demolitions, Palestinians, Rachel Corrie, Rafah, Special Envoy for Middle East Peace, Trial updates, Tried to Influence My Statement, White House. The Palestinian Centre for Human Rights (PCHR) strongly condemns the willful killing of a 15-year-old Palestinian child by Israeli Occupation Forces (IOF). The attack occurred yesterday, 31 August 2009, near the entrance of al-Jalazoun refugee camp, north of Ramallah. According to investigations conduced by PCHR, at approximately 21:30 on Monday, 31 August 2009, IOF troops stationed at a military observation tower inside “Beit Eil” settlement, north of Ramallah, opened fire at five Palestinian children who were near al-Jalazon UNRWA School, located near the southeastern entrance of al-Jalazoun refugee camp. One of the children, 15-year-old Mohammed Riad Nayef ‘Elayan, was wounded by three bullets to the chest. An ambulance from Sheikh Zayed Hospital in Ramallah attempted to reach the area. However, the ambulance was stopped by at least 30 soldiers who prevented the medical crew from attending to the wounded child. Meanwhile, dozens of Palestinian civilians gathered on the spot and attempted to help the wounded child, but Israeli soldiers fired tear gas canisters at the crowd. The ambulance driver, Usama Hassan Ibrahim al-Najjar, 37, was hit by a tear gas canister to the left leg. ‘Ali Ahmed Mohammed Nakhla, 29, also sustained similar injuries. Mohammed was left bleeding for approximately an hour. At approximately 22:30, IOF transferred the child to Beit Eil settlement where he was evacuated by a helicopter to Hadasa ‘Ein Karem Hospital in West Jerusalem. In the early morning, Israeli sources declared that the child had succumbed to his wounds. IOF have continued to hold the child’s body. IOF arrested the four children who were with ‘Elayan and kept them detained in Beit Eil settlement untill 03:00 on Tuesday, 1 September 2009. One of the released children informed PCHR that the children were walking normally in the street where the attack took place and that they suddenly found themselves under Israeli gunfire. The boy said that when Israeli soldiers saw the wounded child falling onto the ground, they rushed to the scene and arrested his companions. The soldiers left the boy bleeding without offering him any medical aid. Reiterates condemnation of this latest crime, which is part of a series of crimes committed by IOF in the Occupied Palestinian Territory (OPT). Calls upon the international community to promptly and urgently take action in order to stop such crimes, and renews its call for the High Contracting Parties to the Fourth Geneva Convention to fulfill their obligations and provide protection to Palestinian civilians in the OPT. A UN agency has halted operations in Gaza after a deadly strike on an aid convoy that prompted UN chief to issue his second call for an Israeli investigation. “Operations will remain suspended until Israeli authorities can guarantee the safety and security of our staff,” said Christopher Gunness, a spokesman for the UN Relief and Works Agency (UNRWA) that had been distributing food aid to about half of Gaza’s 1.5 million population. The decision came after one man was killed and two others were wounded when a UN-flagged convoy of trucks was hit by two tank shells en route to the border with Israel to pick up humanitarian assistance.The Israeli military said it was investigating the incident. Later two UN armoured vehicles that escorted an ambulance to recover the body of a local staff member in Gaza City came under small arms fire during the daily three-hour humanitarian lull Israel has declared in its Gaza offensive, a UN official said. “The secretary-general condemns the Israeli Defence Force (IDF) firing on a United Nations aid convoy in Gaza,” a spokesman for Ban Ki-Moon said in a statement. Ban, who plans to travel to the region next week to push for an end to the Gaza offensive, had already called for a probe of Israeli strikes on UN-run schools on Tuesday. Meanwhile, the International Committee of the Red Cross (ICRC) on Thursday accused Israel of failing to help wounded people in one area after rescuers found four small children too weak to stand up and huddling next to their dead mothers. It said Israeli soldiers tried to force the rescuers to leave when they finally reached the wounded in Gaza City’s shell-blasted Zeitun neighbourhood on Wednesday, four days after safe passage had been requested. “This is a shocking incident,” said Pierre Wettach, who heads the ICRC’s delegation for Israel and the Palestinian territories. The ICRC said that more wounded people are sheltering in destroyed houses. UN trucks etc including UN schools are well marked. This was a deliberate act on part of Israel to stop aid. No doubt in my mind whatsoever. Again and again Israel has attacked the UN. Deliberate actions on part of Israel. This in my opinion is an act of aggression against all members of the United Nations. They are killing UN workers and attacking UN installations such as the schools. This beyond unacceptable. This is an attack on the rest of the world. So to speak. Israel has even been targeting hospitals and ambulances. They are investigating are they.? Well I have heard that line so many times in the past it is just pure BS to appease the rest of us. I don’t believe it not for a second. No sooner did they get a 3 hour truce and the UN driver was killed. Deliberate murder, is more like it, done to terrorize the UN. How perfect for Israel and how devastating for the Palestinians. The plan was perfectly executed I must say. Worked like a charm. What they say and what they do are two very different things. This is typical Israeli behavior. NOW WHO BROKE THE TRUCE? Israel did. They always do. President Bush may have though he’d see the last of shoes being thrown his way, but the anti-war group Code Pink showed up at the White House Wednesday to stage a protest inspired by the President’s much-discussed shoe ducking incident. The protesters took turns throwing shoes at a large puppet that was made up to look like President Bush. A shoe memorial was also laid out on Pennsylvania Avenue in front of the White House to represent the Iraqi civilians who have been killed during the war. Critics of Code Pink say the event was more publicity stunt than constructive discussion of the problems facing a post-Bush administration. The U.S. Secret Service stood by during the protests; however there were no conflicts with authorities and no arrests were made. Anti-war activists from the group Code Pink gathered at a Marine recruiting station in Berkeley this morning to show solidarity with an Iraqi journalist who threw his shoes at President Bush on Sunday. Members of the group and others marched around the recruiting station holding shoes in the air to show support for Iraqi journalist Muntadhar al-Zeidi, who hurled two shoes at Bush during a news conference in Baghdad. In many Arab countries, showing the sole of one’s shoes, much less throwing shoes at another person, is considered extremely disrespectful. Organizers said their demonstration was to show support for the Iraqi people who have been killed, tortured or maimed and U.S. soldiers who have died since the Bush administration’s invasion of Iraq. The Code Pink protest didn’t effect operations at the Shattuck Avenue recruiting station, said Marine Corps spokesman Sgt. Matt DeBoard. For more than a year, women from CodePink picketed weekly in front of the U.S. Marine recruiting center at 64 Shattuck Square in downtown Berkeley. They say the Marines are not welcome in liberal, anti-war Berkeley and that the office should shut its doors. In January, the Berkeley City Council got involved when it officially stated that the Marines were “uninvited and unwelcome intruders” and granted CodePink a permit waiver and a free parking space in front of the Marine center for the weekly protests. The move angered people across the country, who flooded City Hall with about 25,000 letters and e-mails. Please also sign Petitions at below link. Tags: activists, Barack Obama, Berkeley, Code Pink, Iraqi civilians, Iraqi Journalist, killed, maimed, Marine Recruiting Station, Meda Benjamin, Muntadhar al-Zeidi, President George W. Bush, protesters, Rally, Sgt. Matt DeBoard, Shattuck Avenue, shoe in, shoes, tortured, U.S. Secret Service, U.S. soldiers who have died, War, Washington, White House. NATO to consider talks with the Taliban? LONDON — When NATO defence ministers meet in Budapest on Thursday, they will face a worsening situation in Afghanistan and vexing questions about whether the war can be won. Increasingly, military commanders and political leaders are asking: Is it time to talk to the Taliban? With U.S. and NATO forces suffering their deadliest year so far in Afghanistan, a rising chorus of voices, including U.S. Defence Secretary Robert Gates and the incoming head of U.S. Central Command, have endorsed efforts to reach out to members of the Taliban considered willing to seek an accommodation with President Hamid Karzai’s government. Gen. David Petraeus, who will become responsible for U.S. military operations in Afghanistan as head of U.S. Central Command on Oct. 31, agreed. “I do think you have to talk to enemies,” Petraeus said Wednesday at an appearance at the Heritage Foundation in Washington, when asked about potential dialogue with the Taliban. But entering negotiations with the Taliban raises difficult issues. It is not clear whether there is a unified Taliban command structure that could engage in serious talks, and the group still embraces the hardline ideology that made them pariahs in the West until their ouster from power in 2001. During its 1996-2001 rule, Afghan women and girls were barred from attending school or holding jobs, music and television were banned, men were compelled to wear beards, and artwork or statues deemed idolatrous or anti-Muslim were destroyed. In an assault that provoked an international outcry, Taliban fighters blew up two giant statues of Buddha that had graced the ancient Silk Road town of Bamiyan for some 1,500 years. Seven years after the U.S. invasion, what was originally considered a quick military success has turned into an increasingly violent counterinsurgency fight. An unprecedented number of U.S. troops — about 32,000 — are in Afghanistan today, and the Pentagon plans to send several thousand more in the coming months. Gates is expected to press for additional troops and money for the fight in Afghanistan at this week’s NATO meeting. At least 131 U.S. troops have died in Afghanistan this year, surpassing the previous annual high of 111 in 2007. An additional 100 troops from other NATO countries have died in 2008. Canada, which has some 2,500 troops in southern Kandahar province, has lost 23 soldiers so far this year. Speaking in London on Monday, U.S. Gen. John Craddock, NATO’s supreme operational commander, said he is open to talks with the Taliban as long as any peacemaking bid is led by the Afghan government, not western forces. “I have said over and over again this is not going to be won by military means,” Craddock said, adding that NATO’s goal is to create a safe environment so responsibility for security can be transferred to Afghan authorities. The French foreign minister, Bernard Kouchner, added his voice to the rising chorus, saying Tuesday it was “desirable” to have direct talks between the Afghan government and the Taliban, and offering to host any such meeting. The problem, say some analysts, is identifying who within the Taliban can be a reliable negotiating partner. “The Taliban are no longer a monolithic force; with whom do you negotiate if you want to talk with the Taliban?” asked Eric Rosenbach, executive director of the Center for International Affairs at Harvard’s Kennedy School. Rather than high-level, high-profile negotiations, “the Afghan government should pursue talks with individual commanders and warlords” who have renounced violence, he said. Charles Heyman, editor of Armed Forces of the United Kingdom, said there is widespread agreement that the original U.S. and British goal of building a liberal, western-style democracy in Afghanistan is not attainable because the Taliban never were routed or forced to disband. He said the West’s long-term interest would be served by ensuring that al-Qaida doesn’t have a presence in Afghanistan. That would mean making sure any future Afghan leadership, even if it includes Taliban elements, understands that it will come under sustained attack if it allows al-Qaida to set up training camps there. Ayesha Khan, an associate fellow at the Chatham House research group in London, said it is possible that clerics close to fugitive Taliban leader Mullah Omar could meet with Afghan government representatives. The US military has admitted killing 33 civilians in an air strike on a village in Afghanistan in August, far more than it has previously acknowledged. Following the attack on August 22 on Azizabad, in Heart province, the Afghan government claimed that 90 civilians, mainly women and children, were killed, a figure backed by the UN. Until now the US has estimated that that no more than seven civilians died in the attack. It launched an inquiry after it emerged that film recorded on mobile phones showed rows of bodies of children and babies in a makeshift morgue. The inquiry found that of the 33 dead civilians, eight were men, three women and 12 children. The 10 others were undetermined. It also claimed that 22 Taliban fighters were killed in the attack. The inquiry dismissed the Afghan government’s estimate as over reliant on statements from villagers. “Their reports lack independent evidence to support the allegations of higher numbers of civilian casualties,” the US report said. A spokesman for the Afghan government said it stood by its estimate. The US expressed regret for the civilian losses but blamed the Taliban for having chosen to take up fighting positions near civilians. “Unfortunately, and unknown to the US and Afghan forces, the (militants) chose fighting positions in close proximity to civilians,” the report said. The acting commander of US forces in the Middle East, lieutenant general Martin Dempsey, said the attack was based on credible intelligence and was made in self defence. “We are deeply saddened at the loss of innocent life in Azizabad. We go to great lengths to avoid civilian casualties in Afghanistan in all our operations, but as we have seen all too often, this ruthless enemy routinely surround themselves with innocents,” he said. US central command said its investigation was based on 28 interviews resulting in more than 20 hours of recorded testimony from Afghan government officials, Afghan village elders, officials from nongovernmental organisations, US and Afghan troops, 236 documents and 11 videos. The issue of civilian deaths has outraged Afghans and strained relations with foreign forces in Afghanistan to help fight the insurgency. Afghan president Hamid Karzai has warned US and NATO for years that they must stop killing civilians on bombing runs against militants, saying the deaths undermine his government and the international mission. Following the raid on Azizabad Nato’s commander in Afghanistan, General David McKiernan, issued a revised tactics and procedures for air and ground assaults against insurgents. on October 9, 2008 at 9:44 am Comments Off on NATO to consider talks with the Taliban?